The Washington Open (currently sponsored by Citi bank) is a joint professional tennis tournament played on outdoor hard courts, and held annually in late July at the William H.G. FitzGerald Tennis Center in Rock Creek Park, Washington, D.C., United States. The Citi Open is part of the ATP World Tour 500 series on the Association of Tennis Professionals (ATP) World Tour, and of the WTA International tournaments on the Women's Tennis Association (WTA) Tour. The men's competition is part of the US Open Series, a North American lead-up of events to the last Grand Slam tournament of the season, the US Open, in New York City. The 2014 edition took place from July 26 to August 3 2014. The tournament was first held on the men's tour in 1969, known as the Washington Star International between 1969 and 1981, as the Sovran Bank Classic from 1982 to 1992, as the Washington Open in 1993, and as the Legg Mason Tennis Classic from 1994 to 2011. Competition was held on outdoor clay courts until 1986, when it switched to the current hard courts. Throughout its existence, the tournament has been closely associated with Donald Dell, founder of ProServ International, who was instrumental in its creation. The location of the event in Washington, D.C. was chosen at the urging of Arthur Ashe, an early supporter. The women's event was first held in 2011 in College Park, Maryland as the Citi Open, and for the 2012 season, the ATP and the WTA decided to merge their Maryland and Washington spots into a men and women joint tournament, with the women's event moving to the William H.G. FitzGerald Tennis Center, and Citi taking over Legg Mason as title sponsor of the joint event. In the men's singles, Andre Agassi (1990–91, 1995, 1998–99) holds the records for most titles (with five) and most finals overall (with six, an additional lost final in 2000). He also shares with Michael Chang (1996–97) and Juan Martín del Potro (2008–09) the record for most consecutive titles, with two. Inside the William H.G. 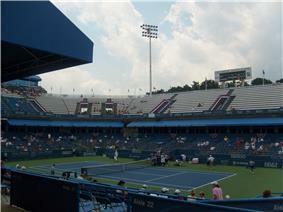 FitzGerald Tennis Center, which is home to the Citi Open. ^ "atpworldtour.com Washington tournament profile". atpworldtour.com. ATP Tour, Inc. Retrieved 2014-10-03. ^ "wtatennis.com Washington tournament profile". wtatennis.com. WTA Tour, Inc. Retrieved 2014-10-03. ^ "Legg Mason Classic in Washington D.C. changes name to Citi Open - ESPN". ESPN Internet Ventures. * Lagardère SCA owns these brands in the United Kingdom only. These brands are owned by Scholastic Corporation in the United States.